As its name implies, a cupboard was originally a shelved structure for the display of silver and other valuables. It was not the closed piece of furniture for storage that we think of today. In the first half of the 1600s, the form was known in England as a court cupboard, although we do not know why. They were often placed in the hall or dining parlour. The owner's silver cups would be arranged on the shelves and set off by decorative cloths to make an impressive show. The pieces were also placed in bedrooms, where they provided shelf space for other domestic equipment. Court cupboards were often carved or inlaid, as on this example. The decoration usually borrows from classical and late Renaissance ornament. This court cupboard appears to have been extensively restored, probably about 1900. The modern work may have consisted of extensive repairs to an earlier cupboard, replicating the original damaged parts, or perhaps the 'restorer' created a the piece using old elements from more than one source. 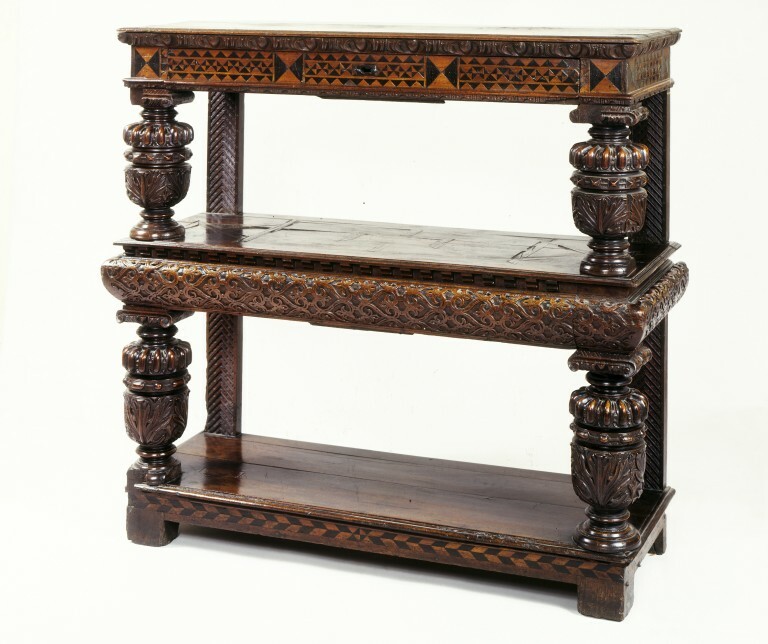 Two tiered court cupboard with two drawers, of carved and inlaid walnut. The two tiers each supported in front by a pair of bulbous columns carved with nulling, chevrons and acanthus, and behind by rectangular uprights carved with chevrons; the frieze of the top is decorated in front and on the sides with inlay of chequer work in holly and bog oak, the front opening as a drawer; the middle shelf is inlaid with a geometrical design, carved with strapwork on all three sides, and opens as a drawer; below the bottom shelf is a band of inlay. The rearmost plank on all three levels replaced, and the back legs probably also replaced. The drawers apparently rebuilt. Some punched decoration possibly added. Egg and dart molding, about 1900, immediately beneath top moulding. Dark stain overall. Buffet, purchased from Martin Tomson Esq, 9 November 1920, of Court Stairs, Saint Lawrence, North Ramsgate. On loan to Woolsthorpe Manor (downstairs parlour), 2014, returned Feb 2018. 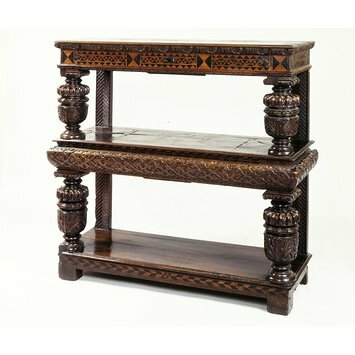 Describes as "1 Sideboard, two-tier, walnut, carved and inlaid - £300"
recounts his August visit to Tomson where he saw "this remarkable piece of Jacobean oak…a two-tier oak sideboard carved and inlaid.. a type of furniture of which the museum ought certainly to possess an example". The owner, Martin Tomson, has no particular knowledge of old furniture and has written to the museum to offer it for purchase. "this Jacobean sideboard…is one of the few types of furniture of its period of which we do not possess a proper example. They are very rare." offers the "old Jacobean dinner wagon that has been slightly repaired" for £300. He believes he bought it at W Bretts sale at St Peters about 20 years earlier. Brett was a collector and newspaper proprietor. the piece was "finer than I imagined…of the highest quality. It proved to be not of oak, but of walnut - a wood rarely used for furniture at that date…I am disposed to place it in the Elizabethan period….Since it has been in the present owners' hands, the sideboard has undergone certain repairs…the renewal of parts of the shelves which had become worm eaten…repairs…do not detract from its value". the receipt of the side board and lists its condition as "worm-eaten; chipped; restored. Pieces missing, including pieces of capitals and bases of upper columns, bottom left corner pieces of inlay. No key". recommends purchasing the Elizabethan sideboard. "It is an object of distinguished appearance and good proportion possessing an unspoiled surface and showing the finest quality in carving and inlay…defects are negligible. There is no question that the sideboard is thoroughly genuine…it would prove a most important acquisition…a rare and important piece for the moderate sum of £300". He continues "the sideboard is so obviously genuine, important and desirable from every point of view". concurs "Mr Brackett has not at all over-estimated its importance: apart from its great rarity, it is just the kind of capital piece by which English woodwork should be represented in this museum". Object sampling carried out by Jo Darrah, V&A Science; drawer/slide reference 1/19. (London 1930), 598, Plate 27. WINDISCH-GRAETZ, Franz: Möbel Europa. 1. Romantic-Gotik. (Munich, 1982), p 181. Measured Drawings of English Furniture, by P.E. Marx and M.S. Tyalor, London 1931, p 74-77. CESCINSKY, Herbert & Ernest Gribble: Early English Furniture & Woodwork. Vol II. (London, 1922), p 58 - 60. 'English Walnut-Tree Furniture of Elizabeth's Reign,' by H. Avray Tipping, in 'Country Life,' Vol. L(? ), p. 623-6, 1921.